While we are not certified organic, we strictly follow organic practices. 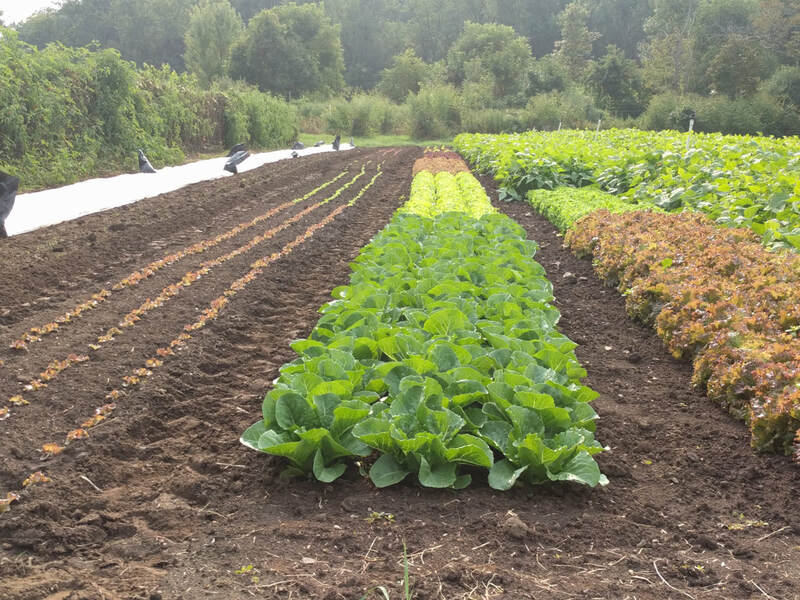 We take great care to nourish our soils through cover cropping, spreading compost made here on the farm, and applying purchased organic fertilizers. We spray only when absolutely necessary (rarely) and only with certified organic products. We are now accepting members for our 2019 CSA - see below for more info on how that works. Veggies are also sold a la carte in the farm store year round. Occasionally, when we don't have certain vegetables available from our farm, we buy in local organically-grown vegetables. Contact us for current availability. CSA, or community supported agriculture, is a method of distributing food that promotes vibrant local economies, environmental well-being, healthy eating, and a strong sense of community. It is an arrangement in which a household pays a farmer at the beginning of the growing season to grow their food for that season. The farmers benefit by having a guaranteed market for their produce and by knowing the individuals that they are feeding. The members benefit by receiving an abundance of food that is fresh, local, nutritious, and chemical-free, and also by having a personal connection to the people and land that grow their food. 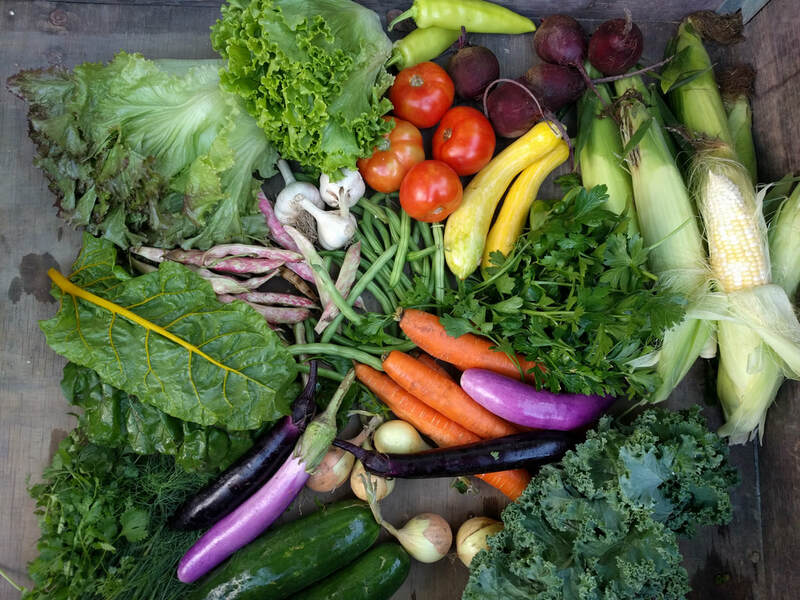 A traditional CSA model charges a set fee and gives out a set amount of vegetables each week. We do it a little differently – our members pay for each person in the household and each week decide for themselves what types of vegetables and how much to take. Why do it this way? Every family is different, different in size, food preferences, etc. The one-size-fits-all CSA model cannot accommodate that. Under this system, you never feel “forced” to take vegetables that you know you will never use, and you can take as much as you want of things that you use a lot of. We also hope that this system helps our members to experience the joys of seasonal eating. It encourages you to eat more seasonal veggies from the farm, and hopefully use these foods to replace the non-local and processed foods in your diet. We have a lot of fun crafting our meals around what is available from our garden, and we love helping our members do the same. It’s a win-win for your health and your world! There are 24 weekly distributions starting in late May. Distribution is on Wednesday from 4pm to 7pm at the farm. (If there are times you can’t make it to distribution, we can always set veggies aside in our cooler for you to pick up at your convenience.) We send an email out every Tuesday letting you know what is available that week. When you come to distribution, you take whatever you need for your household for one week. Once in a while we will set a restriction if there is trouble with a particular crop, but for the most part members can take whatever they want! This is a system based on mutual trust – we trust that you are taking only what you need for your household for one week, and you are trusting us to grow the greatest variety and abundance of high-quality vegetables for you. If you are interested in reading more on how this CSA works before signing up, the following document is our member agreement from 2018, which gives more logistical information. The following “staple” vegetables will be available almost every week: potatoes, carrots, onions (or scallions, green onions, or leeks, depending on the season), beets, lettuce, kale, chard, parsley, dill and cilantro. 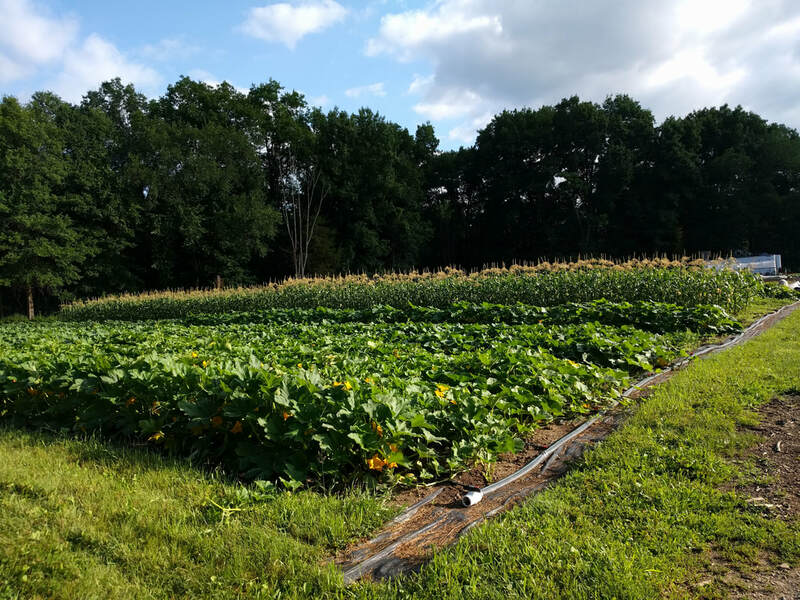 The following summer crops will be available almost every week July through September: summer squash, cucumbers, string beans, peppers, eggplants, melons, sweet corn, tomatoes, shelling beans, and basil. The following cool-season crops will appear in the spring and fall: lots of cooking greens (spinach, arugula, bok choi, cabbage, Chinese cabbage, collards, and others), broccoli, kohlrabi, peas, radishes, and turnips. The following are fall crops that will be available starting in September: winter squash, rutabaga, celeriac, parsnips, and sweet potatoes. This is just an oversimplification; in reality there will be overlap and exceptions, depending on what mother nature doles out this year. But whatever time of year, there is always an exciting variety to choose from! Food & fun at our weekly CSA distribution. Photo courtesy of Teresa Horgan.